Well that was a whirlwind of a month. For those wondering about the absence of yours truly, aka The Guy That Brings You the Geeky Tattoos, wonder no more! I was off getting married and going on a honeymoon! (Yes, of course she’s a geek!) Since I’m the only one running this show, when I’m not around stuff doesn’t get posted. One of these days I’ll hire an intern. Then I won’t have to fetch my own caffeinated beverages any more! But enough excuses, you’re here for nerdy tattoos. At our wedding during the cake cutting we played a little song from Portal you might remember. The geeks in the crowd got a kick out of it and I thought you might get a kick out of Mike’s Portal tattoo. (Did you catch that segue there? I know, pretty slick.) Mike got the tattoo done by Troy at Artistic Skin Design. He says he got into the game because he heard the catchy song on a podcast. 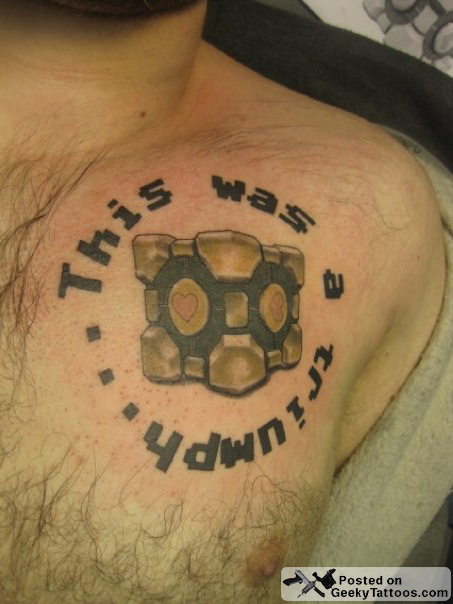 While playing the game, he took a liking to the companion cube, so he got it inked above his heart. How sweet! Tagged with Artistic Skin Designs, chest, portal. Congrats on the wedding man! Congratulations on getting married! And I also want to thank you for taking up some of your free time to keep such a great website going, keep up the good work!